Ace and Allah have pretty much the same post of the same vid set to Pink Floyd's 'Great Gig in the Sky'. I think this is more appropriate. .. And to the Phoenix Police Department, have fun with the new guns Santa (David Spade) brought you. When the past catches up with you..
.. Or What happens when you try to re-write history. Ayers’ editorial was poorly written fiction, a fact that perhaps Larry Grathwohl knows better than anyone. Grathwohl was the only informant to successfully penetrate the Underground for the FBI and personally lived through the history Ayers so desperately desires to rewrite. It would be funny if it wasn't so true. Good for a chuckle or two. Then the five stages of denial. Michael Ramirez captures the UAW in his editorial cartoon perfectly. Majel Barrett, the wife of Gene Rodenberry, passed away. Even if you never seen her on the show, you have heard her voice as the Computer. ...and the cops are minutes away. Best argument for keeping a gun in the house. Global Warming hits Las Vegas. And by Global Warming I mean Global Cooling. Maybe winter. The rarities continued Wednesday night with the Clark County School District's announcement that students are getting a snow day today. It's the first snow day for Clark County students since 1979, when a storm dropped 9.9 inches of snow in January that year. A very Commie Christmas to you all. "I've abandoned free-market principles to save the free-market system," Bush told CNN television, saying he had made the decision "to make sure the economy doesn't collapse." I've abandoned being faithful to my wife in order to save my marriage. I gave up on my diet in order to lose weight. To save the free market system, the market would have to be free in the first place to allow for failure. Keynesian Economics is a fable. When watching this video, keep in mind that everyone that is advising the President on the economy subscribes to the Keynesian Economic system. One way to an economic recovery would be threefold. Cut Government spending. Even the cliche of the drunken sailor would be ashamed. This includes the bail outs of institutions that are 'too big to fail'. Cut Corporate taxes. Why punish the people making the jobs and their achievements? Let the companies that are failing, fail. The marketplace is flexible enough to take in the slack and move away when others business start up. Thanks to Michelle Malkin for the hat tip. There really is a ruling class in the world today. If appointed, Ms. Kennedy would fill the seat once held by her uncle, Robert F. Kennedy. Caroline Kennedy, who has had no experience with politics, whose resume is padded with charity events strictly because of her last name, is now a contender to be, not elected, but appointed as a Senator from New York. Her big uncle Teddy Kennedy is pushing for her to appointed from out of state as well. Speaking of Teddy, back when he had his brain tumor scare, he was wanting his wife to take over for him as well. He has announced that he will be back in the Senate next year to finish out his term. Joe Biden is looking for his own little dynasty, too. By selecting Kaufman, who has said he would serve only two years before a special election is held in 2010, Minner bypassed other interested Delaware pols and ensured that Beau Biden would have a clearer opportunity to succeed his father in the Senate. To Joe's credit, his son isn't taking the position just yet. A special election will be held in 2010 for the Senate but it is all but a forgone conclusion that Beau will be elected to the seat. There hasn't been a Republican since 2000 as a Senator from Delaware and considering the way the GOP has been acting, I doubt there will be another one soon. This special kind of nepotism isn't saved for the Democrats either. The Republicans have their own kind of favoritism going on as well. Republicans are urging [Jeb] Bush, the president's younger brother, to strongly consider making a bid for the seat currently held by outgoing Republican Sen. Mel Martinez. No more dynasties for the US Government. Dynasties in the past only brought out laziness and inbreeding. And that may well be argued with the Kennedy family today. Surely there are better people for those jobs than the offspring or siblings of someone in office. Wasn't that the original idea of how the Congress was supposed to work in the first place? As 2008 starts to wind down, everyone starts to do a best of/worst of top ten list. This one that the Young American's Foundation has done is a must read though. Academia's shining examples of tolerance. That is one of the more milder of the listings. All in how you look at it. "When it's a Republican scandal, the press become prosecutors. When there's a Democrat scandal, the press become defense lawyers." and thanks to the McCain that I do like. This is the United Auto Worker's contract with Ford. There might be a page or two difference between GM and Chrysler. Not too much in there on how to make a better car to compete with imports. 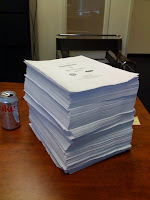 I’ll tell you this much, those 2,215 pages don’t include much regarding efficiency and competitiveness. What you’ll find are hundreds of rules, regulations, and letters of understanding that have hamstrung the auto companies for years. This is why the Big Three are sucking wind when the UAW labor contracts are sucking the life out of the Big Three. Any pontential 'bail out' from the federal government will be going on to pay off the unions. Even when the bill was voted down in Congress on the Senate side, the White House may still set aside a chunk of change for the automakers. Which will be passed on to the Union workers. If GM, for instance, would be forced into Ch. 11, one thing they can do is to cancel a 22 pound labor contract and have 'Right to Work' instead to get by. Even catch up with Toyota in terms of profit. Most people have misunderstood the timeline of the Blagojevich Senate scandal. Pretty much everything fits except Barack Obama's statement yesterday that he knew nothing about it. If we didn't have Obama's denial to contend with, the actions of all the parties, including those purporting to speak for Obama, are consistent with Obama and his staff learning about Blagojevich's corrupt plans on Monday, Nov. 10. And the actual Senate Seat in question was on E-Bay but the lot was pulled. Luckily, IowaHawk has screencaps of the auction. Jonah Goldberg at the Corner at National Review. He wasn't found opening an umbrella in parts of his anatomy for money on the internet, or giving cash to terrorists who were going to have Santas wear suicide-padding at department stores around the country. He didn't check interns for a hernia without permission or spy for the Norks. He's just a crook. A good, old-fashioned, crook. Thanks to Hot Air and their headlines. How much is a US Senate seat worth? Rob "Nothing But Sunshine" Blagojevich, the Democratic Governor of Illinois, was arrested today on charged of corruption. Hot Air has the goodies on it all. As well as Ace of Spades and the Flaming Skull: Blagojevich Edition is up too. Labels: Barack Obama, Rob's Hair. The one time Newsweek will ever use religion as an argument FOR something. Salvador Dali gets one but not Pearl Harbor Day? A Day to Live in Infamy. Unless you are Google and then no fancy logo for you. Facts about scary looking weapons. There has been a lot of talk about the 'Assault Weapons Ban' making it's return to congress. This time, with no expiration date. The truth is that the law that was passed is a 'Scary Looking Weapons' ban. This video was made back when Clinton enacted the law the first time but still as truthful then as it is now. Vanity Fair has an application someone leaked out. Soon you can have millions of free money for the failing industry of your choice. The Federal Reserve will print more. Thanks to Ken M. at Michelle's. and yes, I know it's a joke. Andrea Tantaros has some good points. I would be amiss not to point out that Ted Steven's seat needs to be a special election. Palin can't appoint herself to it. Thanks to former Gov. Murkowski for nominating his daughter instead. The legislator of Alaska changed their laws from appointment to special election because of him. Nepotism at it's finest. Lt. Gov. Sean Parnell would be one to tackle the Senate run, in my dream team of politics. In this year's election she was our most valuable player, and like any MVP her political athletic ability is a force to be reckoned with. She has youth on her side which will make her viable for the next two decades (at least). She posesses the supernatural ability to draw tens of thousands to a rally. Her fundraising potential is boundless and her biography is politically seductive. With Palin as Governor as Alaska, she would be one of 50 executives. Not one of 100 compromisers and debaters. And get started on the Alaska Highway Pipeline for one more feather in her cap. Besides, in terms of executive power, the Governor of Alaska is one of the top five posts in the fifty states. Massachusetts being the first, Vermont (think Howard Dean) being the last in terms of executive power. Politico's artical missing one minor detail about Obama's fund-raising abilites. From Jeanne Cummings at the Politico about how Obama has raised close to 'One BILLION dollars' from his campaign. She did miss one minor detail about the donations. Obama’s achievements stem largely from two choices: He cast a wider net to attract donors during the crowded Democratic primaries and caucuses, and he was willing to hand over some control to both small and large donors. Nothing wrong with wanting to donate to the man you want to win the election. But it does call into question when so many safeguards built into website services software regarding online transactions are turned off. Last I knew, John Galt from Ayn Rand Lane, Bart Simpson from 742 Evergreen Terrace, and Good Will Hunting could still donate to Barack Obama. Congratulations to one of my favorite Blogs. Hot Air is on it's way to being a serious challenger to the LA Times web site. This means Hot Air had 31.58% of the traffic that all of latimes.com had in October 2008. That’s almost 1/3 the traffic of the entire web site of a major American newspaper. Hot Air has two guys blogging full time and the occasional posting by Michelle Malkin when she takes a break from her own blog. Compared to the number of people working at the LA Times. If Hot Air only had a crossword. Patterico's might be down at times, there has been a few hosting issues from what I understand. There is the link to the regular site. Then scroll down some. Exclusive video of shoppers trying to get their big bargain on the Friday after Thanksgiving. Just not from a Wal-Mart in Long Island, NY. I wish I had a dollar for every time I read or heard someone say that 'deregulation' of the markets is what caused the downturn in the economy. When was the last time the federal government deregulated anything? And what was the part that was deregulated to cause this? Shouldn't it make sense to regulate that part again to help correct the economy? There never were any 'deregulation of the markets' only a buzzword that a Democratic controlled Congress drops to pass the buck of blame to someone else, namely, the President. Why then should capitalism take the blame today--when capitalism doesn’t even exist? Consider the current crisis. The causes are complex, but the driving force is clearly government intervention: the Fed keeping interest rates below the rate of inflation, thus encouraging people to borrow and providing the impetus for a housing bubble; the Community Reinvestment Act, which forces banks to lend money to low-income and poor-credit households; the creation of Fannie Mae and Freddie Mac with government-guaranteed debt leading to artificially low mortgage rates and the illusion that the financial instruments created by bundling them are low risk; government-licensed rating agencies, which gave AAA ratings to mortgage-backed securities, creating a false sense of confidence; deposit insurance and the “too big to fail” doctrine, whose bailout promises have created huge distortions in incentives and risk-taking throughout the financial system; and so on. In the face of this long list, who can say with a straight face that the housing and financial markets were frontiers of “cowboy capitalism”? My thanks to Cox and Forkum. Thanksgiving night, I went to a friends house for desert and fun. After meeting their family and a slice of delicious cake, his two kids broke out their Nintendo Wii. Everyone had a chance to play a game or two. My two daughters even beat each other up with the boxing part of the game. The next morning, my wife was on the computer, searching through E-bay, Best Buy and other sites looking to see how much she would have to spend to purchase Wii. I think we might have to wait until after the holidays for that great deal though.